Mahabongo's music is sophisticated jazz/pop, with great melodies, interesting lyrics and top-level jazz instrumentation. A range of styles is powered by slick and energetic drumming and percussion. 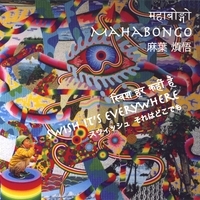 \'Swish It\'s Everywhere\' by Mahabongo is a new album by an exciting new band, put together by Matthew Clark. Written and arranged by Matthew, who sings and plays guitar (and some bamboo flute), the album features some exceptionally talented musicians who have worked with a wide range of contemporary pop and jazz artists. Very long in the pipeline, the ten songs on this album have been selected from Matthew\'s wide repertoire of songs. The album was released on 17th June 2008 on a new, independent label, mahabongo.com, and is available to purchase, download and to listen to on CD Baby.com. This is exciting \'jazzy\' pop, combining catchy, melodic songs with great musicianship.